Once a year, hundreds get free care, but the gesture shines a light on Maine’s status as a state without an adult Medicaid dental benefit. Mary Rena stepped into a spacious yet bustling room at the University of New England’s Portland campus Friday for a dental cleaning – alongside 39 other adults who showed up for free dental work. Rena, 58, of Portland, said her new sales job doesn’t include health or dental benefits, so the free cleaning is appreciated. The university is one of six sites in the state that offer free dental care one day per year, an event called “Dentists Who Care for ME.” About 120 Mainers got free dental work at UNE – including cleanings, fillings and extractions – and about 500 received care overall including the other five sites: South Portland, Skowhegan, Scarborough, Falmouth and Presque Isle. At UNE, third- and fourth-year dental students did the work under the supervision of volunteer dentists. Maine is one of 13 states that has no adult dental benefit in Medicaid, except for emergency work. 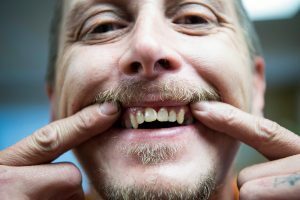 Four states have no dental benefits for adults under Medicaid, while the remaining 33 states plus the District of Columbia have at least limited dental benefits – such as free cleanings – or comprehensive dental benefits. Some workers who earn too much to qualify for Medicaid may have health care coverage through their jobs, but their employers don’t offer dental plans. The lack of Medicaid benefits for adults, plus low reimbursement rates for children, creates significant coverage gaps in Maine, experts say. 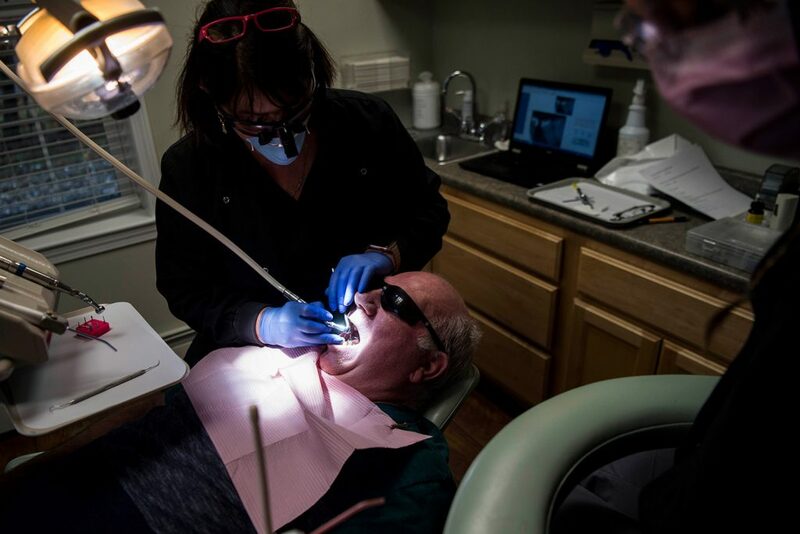 Dr. Jonathan Shenkin, past president of the Maine Dental Association, said while the free day is helpful, it’s not a strategy to take care of Mainers’ dental needs. About 100,000 of the 260,000 Mainers who have Medicaid are non-elderly, non-disabled adults who would stand to gain from a dental benefit. An additional 70,000 Mainers would be eligible for Medicaid under expansion, which voters approved in 2017 but hasn’t been implemented yet because of a court fight between the LePage administration and expansion advocates. Dr. Demi Kouzounas removes and replaces a filling and fixes a cracked tooth for Bruce Tibbetts of Mount Vernon during the Dentists Who Care for ME event Friday at Northwoods Dental in Skowhegan. Tibbetts and his wife both made the trip to Skowhegan for the free dental clinic. Tibbetts, a state employee for over 40 years, has not had dental insurance for himself and his wife since he retired. Shenkin, a pediatric dentist in Augusta, said the state has “ignored everything” except for efforts to get more dentists practicing in Maine. Maine has traditionally had a shortage of dentists. The state’s rate was 50 dentists per 100,000 people in 2017 – well below the national average of 61 dentists per 100,000, according to America’s Health Rankings, a study conducted by a private foundation that compares states on a number of health issues. Maine taxpayers helped get the UNE program off the ground by approving a $5 million bond issue in 2010 with $3.5 million of that going to help establish the dental school, which opened in 2013. Maine also has sought to address the dentist shortage by approving a bill in 2014 that created a new licensed position, a dental therapist. Dental therapists can do cleanings, fill cavities and perform other dental work, but major dental care still must be performed by dentists. Shenkin said the underlying problem for access to care is the lack of an adult Medicaid dental benefit and low reimbursement rates for pediatric dental care. The reimbursement rate for pediatric dental work in Maine is 44.6 percent of what a commercial plan would pay for, compared to the national average of 49.4 percent. 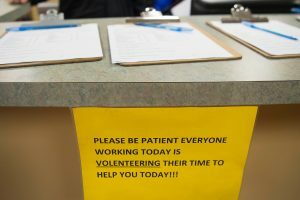 A sign at the front desk at Northwoods Dental in Skowhegan appeals for patience during Friday’s dental clinic. More than 30 people were for free at Northwoods Dental alone. Shenkin said even children who are covered under Medicaid sometimes have a difficult time getting appointments. The low reimbursement rates mean that dentists who accept Medicaid patients must limit the number of Medicaid patients they see to avoid losing money, he said. Rena said paying out-of-pocket for dental care is expensive, usually between $150 and $200 just for a cleaning, so she has tried to save money by taking advantage of programs like the free dental care day and getting reduced-cost cleanings at the University of New England, which operates a reduced-cost clinic for uninsured Mainers. 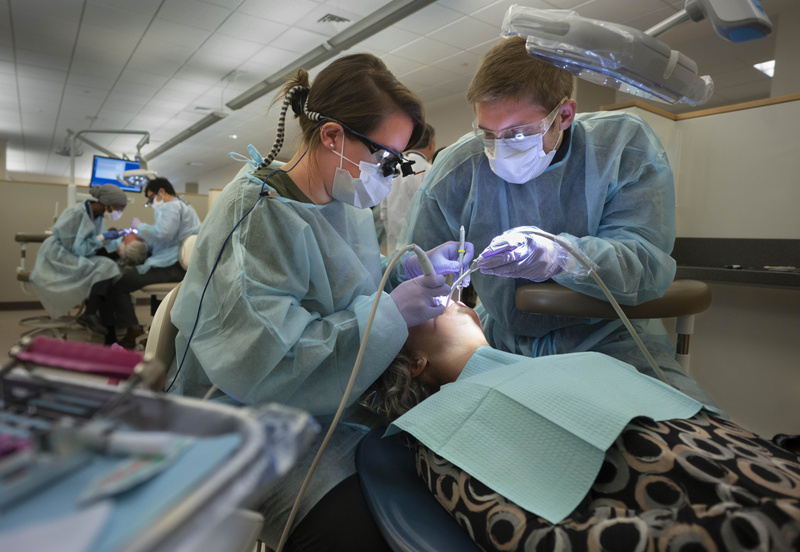 UNE is working to ease the dentist shortage with its program, said Dr. Fields Farrior, associate dean at the dental school. Of the 63 students who graduated in 2018, 18 stayed in Maine, and the program also sends students on 12-week “externship” programs to help dentists in rural locations in Maine, Vermont and New Hampshire. “This (free day) program fits into our mission of bringing access to care to patients,” Farrior said. Ryan Mann shows off his two front teeth, which were fixed by Dr. Demi Kouzounas at Friday’s free dental clinic at Northwoods Dental in Skowhegan. Angela Cole Westhoff, executive director of the Maine Dental Association, said that every dollar spent on prevention will save $7 to the health care system down the road because problems that are ignored become emergencies and require more expensive procedures. A 2010 study by the University of Southern Maine cited dental pain as a major driver in preventable emergency room utilization in Maine. That study has not been updated, but Shenkin said the underlying shortcomings with the dental care system in Maine remain the same as in 2010. Stephanie Beeckel, a third-year dental student at UNE who worked on Rena’s cleaning, said the free cleaning day and the reduced cost clinic help students like her gain the practical skills she’ll need when she enters the field. Beeckel, 25, of Augusta, said she plans to stay in Maine. Rena said she wasn’t expecting to go to the dentist Friday, but learned of the program Thursday. “This is a great opportunity to get really good care and help people like me who have a gap in their health insurance,” Rena said.